Jazz Community Site - Jazz Team Blog » What’s new in Rational Team Concert 6.0.6? My favorite feature in this release is a one-click Create Child Work Item option in the work item editor. When you need to task out a story or just create a lot of child tasks, this new icon will create a child work item from the parent work item type you are viewing. This common task, which originally took many clicks to accomplish, now gets done with a single-click. It is also nicely integrated into the work item process so that the out of the box templates support the parent-child work item hierarchy. And, if you want to have a different work item hierarchy you can set the default child work item type for your custom work item workflow as an attribute. So if you have Epics, Story, or Task as your workflow, you can set the default child work item type for each parent work item to match your own workflow. Another cool feature is that when I Create a child work item, it inherits the Planned for from the parent as an attribute, which is generally what users are looking for. A real time saver for your users! This release has full support for all four levels of SAFe 4.5 out of the box. You pick the process template such as Essential SAFe that corresponds to the SAFe level you wish to implement and go from there. There are also about fifty new or updated reports that are great examples of how to use JRS to build multi-program or other reports such as cumulative value or custom burnup reports. For more information, see www.jazz.net/safe and the SAFe-Reports link at the bottom of that page. It is now possible to query for empty tags which is a good way to locate unused tags. It is also possible to control who can import work items as a role-based permission. So if you only want project leads importing work items you can assign them this new permission. In an earlier release, anyone who could edit work items in the current project could import work items. Do you have many streams and multiple workspaces that your developers are managing? Do you build software and products that support many variants for different product lines? Or do you just want to organize or locate streams that contain a certain component or a certain custom attribute? In this release, we’ve added support for stream queries and stream and workspace folders. So now, you can create nested folders to organize all the streams and workspaces you work, making it easier to work on many different product line variants with little confusion. 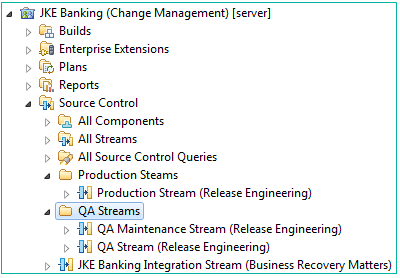 The stream folders can also be dynamically created by using stream queries. 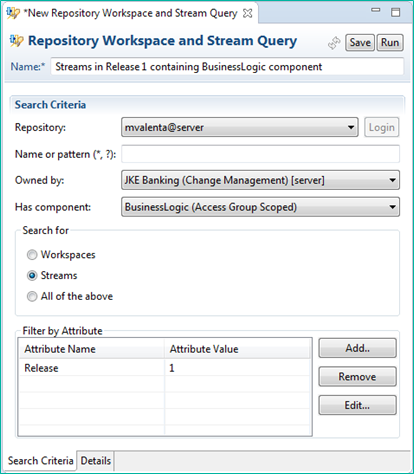 For example, if you want to create a folder that contains all the streams that have the Business Logic component in it and the “Release 1” attribute, in the folder hierarchy you can place a stream query that would then populate those streams in that folder. So instead of having just a flat list of all your streams, you can now organize hundreds of streams into folder hierarchies to keep things manageable as product complexity grows. When I ask customers who develop complex systems software what their greatest challenge is, they often say something like, “Cross team dependencies that we did not know about until it was too late”. These delays can cost a company millions of dollars in lost potential profits if products are delayed to market. RTC has always had the ability to declare dependencies using “blocked by” or “depends on” link types. You can query on these link types to review and report on dependencies, but what happens if your programs get more complex and the delivery of changes is spread across software and hardware teams? 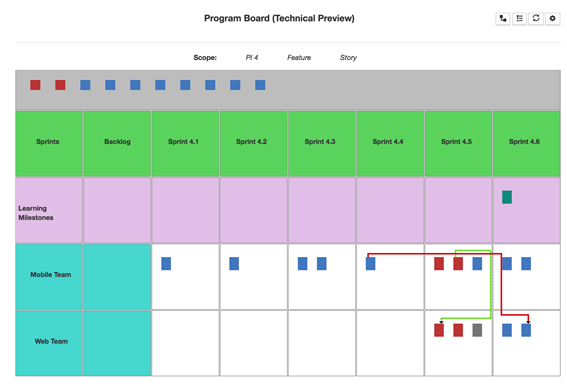 How do you spot and manage all the dependencies between the various product teams? Most of our CLM products are 100% web-based. RTC is a little different in that developers use it in Visual Studio IDE’s or inside the Eclipse IDE, and so we have native integrations with those tools. Hardware engineers who also need to manage work or deliver small software changes often do not use IDE’s to version or check in work. So we have continued to provide web UI support for more advanced SCM features. 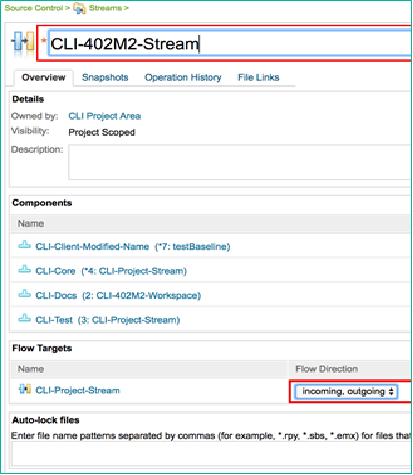 In this release, a lot of new support for stream management is added as well as the ability to set a global configuration context in the RTC SCM web UI making it easier to manage global configurations. In this release, it is now also possible to create, delete and manage Jazz Build Engines from the web UI. This is especially nice for Visual Studio teams who prefer to manage builds from the web UI. Our Continuous Engineering Solution adds real value to any development team when they use open source tooling. For example, we have our own Team Concert Jenkins Plug-in that allows a team to use Jenkins as their continuous build engine and still get full traceability support for work items included in the build and RTC SCM changesets. Our Jenkins and Git-Jenkins integrations are delivered through a separate release channel which also allows teams using older releases to stay current with the latest Jenkins enhancements. We have released Team Concert Plugin v1.2.0.5 and Team Concert Git Plugin v2.0.0. The release notes are available at https://wiki.jenkins.io/display/JENKINS/Team+Concert+Plugin#TeamConcertPlugin-1.2.0.5June15,2018 and https://wiki.jenkins.io/display/JENKINS/Team+Concert+Git+Plugin#TeamConcertGitPlugin-2.0.0June15,2018. For repository workspace and stream configuration, we now create links to the Jenkins build in all the work items associated with the changesets that were accepted in the build. This provides traceability from work items to Jenkins builds. As part of the serviceability effort, users can see the version of build toolkit used in master and slave nodes in Jenkins build log. This is useful for troubleshooting build toolkit issues. Now has Support for Pipeline Job which was already supported in the Team Concert Plugin. The pipeline project type in Jenkins is suited to building declarative CI/CD pipelines. You can view registered Git repositories from all project areas by setting the scope to All. You can also filter the results by entering a name or URL. To access the Browse Registered Git Repositories page, click Source Control > Work with Git, and then click Browse Registered Git Repositories. In addition, when you create work items by using Git commit comments, you can now specify the Found In Work Item attribute and other attributes of the Deliverable attribute type. Two keywords, rtcwi and work item, were added for specifying work items in the Git commit comment. You can also use the two new keywords and the existing supported keywords: task, defect, bug, workitem, and #. There is a new work item query editor to make it easier to author queries without leaving the Visual Studio IDE. This release is an extended maintenance release which means it is a good release to upgrade to if you have been waiting to upgrade as it will have a long-lived iFix and security fix stream. We are also declaring this to be the last release where we will support Tomcat. For many releases, we have been bundling WAS Liberty instead of Tomcat so if you are still using Tomcat you will need to plan to migrate in the future to WAS Liberty which is bundled with RTC v6.0.6. We have also announced with this release that we officially support Windows 10 Semi-Annual Channel which more customers are adopting. The Semi-Annual Channel is a Windows 10 twice-per-year feature update that releases around March and September, with a Microsoft 18-month servicing period for each Windows 10 SAC release. This means that we will test new releases of CLM/RTC with the latest Windows 10 Semi-Annual Channel at the time of release and if a new one comes out we will still support any defects that may arise from it through our iFix channel policy. Just another reason to consider upgrading to v6.0.6 for Windows 10 users! Finally, I want to point out that in order to better support rich text features in our web-based work item editor in the future, we now display a link in the RTC Eclipse Client for any fields that contain rich text. Today the only fields that support rich text out of the box in RTC work items are the description field along with any custom large HTML fields that you may create. When an RTC Eclipse Client work item editor encounters rich text fields it will display a link to edit that field using the RTC web-based work item editor. By default, rich text support is still turned off but you can easily turn it on as an admin function on the server. When turned on, all your users will be able to edit rich text description fields using the web-based work item editor – which is embedded in Visual Studio and is now also linked for any rich text fields in the Eclipse IDE. Be sure to let us know what you think of this new release! A short question regarding Team concert plugin used for integrating Jenkins, Is this officially supported by IBM?